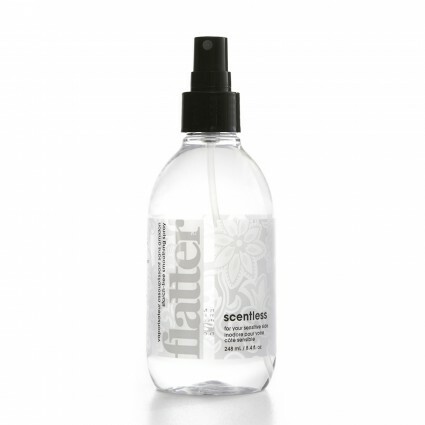 FLATTER SPRAY 8.4oz SCENTLESS This smooth operator leaves fabric sleek, soft and static-free. Made with Plant Derived and Renewable Ingredients, it has no sulfates, no silicones, no SLS or SLES – and definitely no wrinkles. Plus, the mild formulation is easy on sensitive skin, and won’t harm the environment. Makes ironing easier. Soft mist sprayer for an even distribution . No flaking, clogging or residue. Protects fabric to reduce and resist wrinkles.